oh, how this ^ speaks to me right now. dear-hearts, i am in the midst of packing and moving and finishing up last minute wedding details, and all the while i am trying not to drown in a sea of bittersweet emotions. and this - this photo i stumbled upon from GodVine - was just the most perfect of pick-me-ups. can i ask something of you? would you mind covering jared and i in prayer? prayer for my emotions as i transition into becoming a wife, prayer for my move across the state this weekend, prayer for my new job, and prayer for our soon-to-be-marriage. mind if i stop and pray here for you and i right now? when stress makes us believe that things have to be within our control, or else our world will fail and we'll fall to pieces, please re-direct our hope, our faith, our thoughts, back towards your chosen path for us. 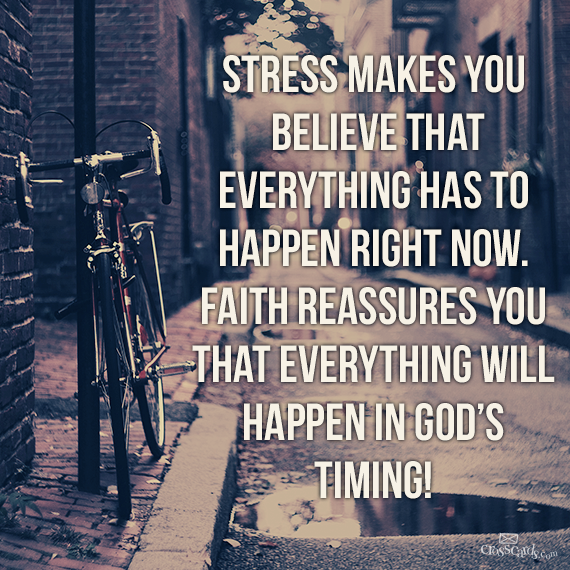 help us to find that steadfast faith in you - kicking stress to the curb. that faith which drowns out the prideful act of worrying and stressing. let us be found; truly reassured that you have a plan for us, even in the midst of BIG CHANGES and UNCERTAINTY. we lay our fears and stress before you, and ask that you would graciously deliver us - one by one - until there is nothing left but trust in your wonderful plans for us. embrace today for all of its potential. Praying for you and Jared! Your prayer is just what I needed tonight. I think we are living twin lives at this moment in time. ;-) I pray you and Jared may be filled with His peace. Oh, dearie, it always blesses my heart when you get transparent and let your heart shine through (which, lest that be confusing, is more often than not). Your willingness to be vulnerable is something I admire--and seek to imitate--in you. I love this beautiful prayer, and I echo every word. I am praying so hard for you, him, and Jarah together! This girl loves watching you take the big, bold step from woman to wife...and this friend is there as prayer-partner, shoulder, hand, and kindred heart. <3 We're finding that comfort. Thankful for you and your prayers for us. Thankyou for being so open and honest! These are exactly the words I needed to hear. "Lord bless Sarah Elizabeth and Jared as their lives are changing and transitioning into the beautifulness of marriage. Father help Sarah Elizabeth as she is worrying about the future things and help her as she moves onto the path that you have put her upon. God bless them both as they are getting ready to begin a journey together. In your precious name Jesus. Amen." Thank you, immensely so, for your prayers for my love and I. My heart is filled tonight knowing that sharing my struggles and prayers with others has been met with such precious reception - beautiful endearing prayers, and much love. Hi Sarah! So fun to find your blog today! Of course I will pray for you and Jared. And what a crazy time for you now. But then, you take the time to pray for all of us. How special is that? Don't let that stress take you away from the journey, or make it less of a joy. Doesn't seem like it now, but it will be that joy for you and Jared for sure. Thank you for blanketing us in prayer, Ceil. I'm doing my utmost to drown that stress out, and so far some quiet and Jesus has done me very well indeed. Blessings to you as well! Thank you for your prayers. :) I read this at a much needed time. I pray for your happiness & peace during this transformative time! Thank you so much for your kind words, Jade! I'm so glad you found your way here - looking forward to visiting your blog soon.